Gosaikund is one of the hindu holy place and is considered to be made by Lord Shiva. The Buddhist Tamang that live nearby also revere it as their holy place. Every August on full moon nights lake is thronged with pilgrims for a big festival. On other days the lake sits in a tranquil atmosphere. This is the most easily accessible of all areas from Kathmandu. It lies about 70k.m north of Kathmandu. 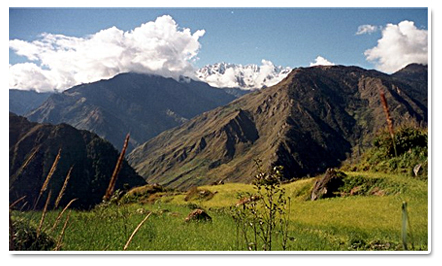 valley, is an area inhabited by sherpas. The language , culture and dress of the Helambu sherpas are very different from those of Solu khumbu sherpas. Welcome dinner in the evening. Day 02 Full day Sightseeing in Kathmandu Valley. We will be visiting three of the famous heritage sites in Kathmandu. You will visit first the Swayambunath Stupa (Monkey Temple). It is said that Swayambunath Stupa is more than 2,000 years old, and it symbolizes knowledge. The painted eyes on all four sides symbolize the all-seeing power of Buddha. It is an important Buddhist place where pilgrims from all over the world come. It is a 30 minutes drive to Boudhanath Stupa, another important Buddhist pilgrims site. This ancient Stupa is considered one of the biggest in the World. Every morning and evening, many Buddhist devotees come here to pray and circumambulate enabling the visitors to observe local religious practices. One of the holiest hindu shrines in the world, The fabulous pagoda houses the linga of Lord Shiva and people bathe in the Bagmati River with a faith of cleansing themselves spiritually. Many Sadhus or Hindu Ascetics live here. During religious festivals, Hindus come to make offerings, and it is sometimes very crowded. Bhaktapur Durbar Square: This former royal palace complex offers the elegant 15th century Palace of 55 win-dows, artistic courtyards, the Golden gat. Patan Durbar Square : Durbar Square an enchanting melage of palace buildings, courtyards and pagoda temples, is the center of Patan's religious and social life. Bus ride to Dhunche for 8 hours. Dhunche is the center of this area and has public offices and army camp. The trail continues in the road till Barkhu village(Tamang). After here the path will leave the roadway and go on the flankto the right . you will have to make ascent. Crossing streams ascend a little further and you will reach the end of the ridge called Noudhara. You will have a clear view of Langtang infront of you. The path continues on the flank with Gompa go the end of the ridge and you will be Syabru village. The path continues uphill through Rhododendron and pine forest till Sing Gompa. There is old Gompa and cheese factory. From here the path gently ascends the mountain flank with bare trees. After crossing the ridge . you will be going through a forest full of moss and fern. While you reach to Lauribinayak there is a spectacular views of Dhaulagiri, Annapurna, Ganesh Himal and Langtang Lirung. The best view point for entire trek. Crossing over the ridge of Saraswati Kund apper the first of several Lakes dedicated to different divinities. Gosaikund is the third lake, sacred place of Hindus and Buddhist. After crossing the Lauribinayak pass(4610m) trail descends through stone path and forest to reach Ghopte. From here trail continues ups and down through forest and walking in ridge of hill. You can have a good view of Helambu and Tadhi Valley. Trail descends all the way to Patibhanjang. From here climb uphill for 2hours to reach chisopani. In a good day you can have a another spectacular views of mountain from Annapurna range to Everest. Day 11 Chisopani / Sundarijal to Kathmandu. After chisopani trail goes uphill for one hour till Bhanjang through forest. 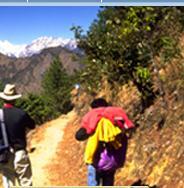 From Bhanjang trail descends all the way to Sundarijal via forest and several villages along the way. Bus ride will take about one hour from sundarijal to Kathamdnu. An experience guide (trained by Ministry of tourism), necessary Trekking staff and their meal/accommodation/transportation/salary/insurance/equipments. Nepal entry visa fee US$ 30 (duration 60 days from date of issue)- Available at Royal Nepalese Embassies and Royal Nepalese Consulates abroad or on arrival at Tribhuvan International Airport in Kathmandu.